A small group of KHS students travelled to the Institute of Education to compete in the UCL Schools’ Debating Cup, a fiercely contested event with teams from some of the best debating schools in the country (such as Dulwich College, Eton and St Paul’s Girls). Kingsbury High School was represented in the competition by Aaron Stevens and Arran Jabbari, two Debating Society regulars but external competition “novices”, with support on the sidelines from Nikita Shikotra and Nauman Zahid; and Kingsbury’s Head Boy, Haider Nazerali, competed for the Debate Mate organisation with a partner from another school. They all enjoyed the competition and the motions were challenging but also very interesting. It became clear, as the competition progressed, that Haider’s team was heading for the finals and we all stayed to watch his brilliant performance in the semi-final (on requiring games manufacturers to promote female protagonists), followed by his characteristically strong contribution to an exceptionally hard-fought final on a motion proposing the selling of citizenships. In the end Haider shared joint first prize with his Debate Mate partner as Best Speaker on the Day (highest scoring across all debates) and was a Runner-Up in the Final, with the Debate Mate team narrowly losing to Dulwich College. Haider is next representing Kingsbury High School in the National Finals of the Cambridge Union Schools Debating Competition, in which he will be partnered by Head Girl, Sara Dehvari. The school will also be represented in these finals by Salem Ali and Akira Allman, who have performed superbly in Wednesday lunch-time debates over the course of the year. As the Upper School Debating Society brings its season to a close, and the Lower School Debating Society looks likely to host the English Speaking Union’s London Debate Challenge this term, it is a pleasure to reflect on the year’s highlights (so far). 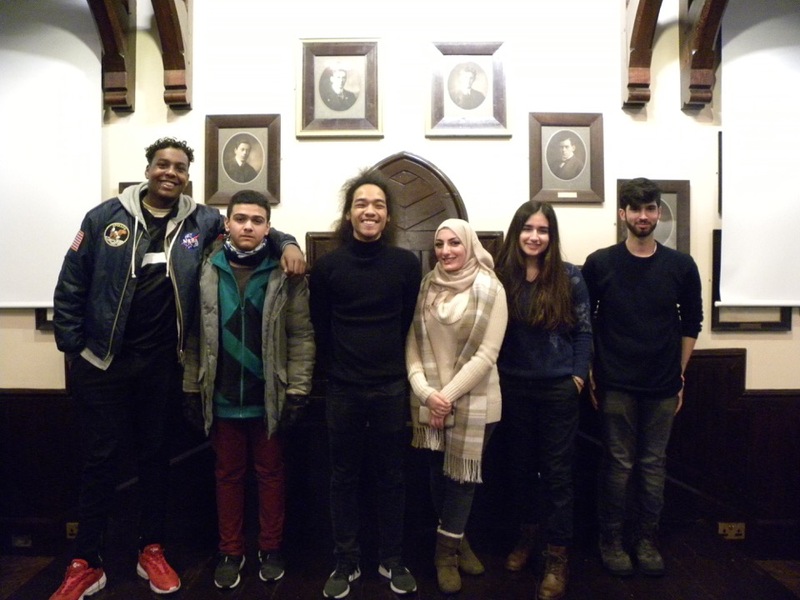 The crowning achievement was the success of Iman Mohamed (Year 13) and Sara Dehvari (Year 11) in reaching the National Finals of the Oxford Schools’ Debating Competition at the prestigious Oxford Union. Kingsbury High School was one of a very small number of state schools represented and the only one from the Brent and Harrow area. In debating, we are proud to make our claim of being the “finest for miles around”. The girls represented the school with distinction, having beaten first-class opposition in the regional round at Woodside High School to get to the national finals. Over a thousand schools had been knocked out on the way to the finals, which indicates the scale of this achievement. Sara is hoping to repeat this success during her years in the Sixth Form. In addition to this achievement, the Sixth Form fielded five delegations (21 students) at the annual City of London School Model United Nations to compete against some well- known grammar and independent schools from in and around London. All performed brilliantly on the day but special congratulations are reserved for the efforts of Hadi Hijazi and Mahima Vekaria, both Year 12, for their excellent contributions to committees, and to Dhruv Sharan (Year 12) and Iman Mohamed (Year 13) for attaining ‘Highly Commended Delegate’ Awards. City of London School Model United Nations. Photograph by Hadi Hijazi. In public speaking, the school hosted the Jack Petchey Speaking Competition and our speakers, both in Year 10, were inspirational to watch: well done to Vinitha Vasantharajah, who set the standard for the evening with a fantastic opening speech, and to Hassan Naima, a prize-winner on the night, for his passionate oratory. The school provides for debating and public speaking opportunities across the age range, from Year 7 through to Year 13, which includes Lower School and Upper School clubs, externally provided debating workshops (this year run by Debate Mate, Jack Petchey Speakout Challenge and the English Speaking Union), internal mentoring, and competitions. We have fielded teams this year in the Oxford Union, Cambridge Union and English Speaking Union Mace competitions. In the latter, Xane Mills, in Year 7, and Nouh El-Ouaz, in Year 8, deserve particular praise for thoughtful points made in the floor debate at Haberdashers’ Aske’s School for Boys in Elstree. Thank you to the debating and public speaking post-holders in K (Ms Michal Tumber and Mr Andrew Mitchell) and T (Ms Nicole Assaad); to Ms Annette Woodrow for organising the Jack Petchey opportunities; to SLT and Year Leaders for their keen support; to the student debating mentors in Years 11, 12 and 13; and finally to Sakthy Uthayakumar, Head Girl, for choosing to use her richly deserved Jack Petchey Award to fund a debating workshop for the benefit of Upper School students.